Each of these lists are updated regulary. If another page is not opened, a PDF file will download when you click on a link. 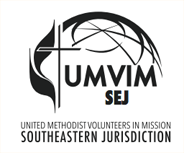 If you have any questions, please contact us at sejinfo@umvim.org or 205-453-9480. This is a list of the Long Term Recovery Projects in the Southeastern Jurisdiction. For outside the Jurisdiction, there is a link on the bottom of the project list with a link to a map of the United States with all the recoveries going on right now. International Leaders: Apply to Add Your Project to Our List! If you lead an international project site and are in need of volunteers, you can apply to be on UMVIM's international project list! Email sejinfo@umvim.org to access the application.